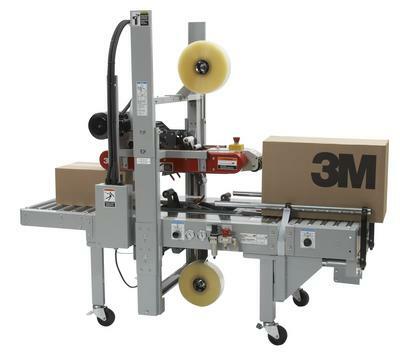 King-size random case sealer for consistent flow and sealing of a variety of larger cases at up to 15 cases/min. Automatically adjusts for case height and width. Includes 3M AccuGlide II Taping Heads for low-impact application of tapes up to 72 mm wide. •Randomly adjusts to handle multiple box sizes. •Top and bottom belt drive for positive box conveying. •Rugged construction with 16-gauge welded steel frame and epoxy paint finish. •Food and beverage, paper and print, distribution centers, pharmaceutical and general industrial. •Random case sealing, box sealer and taper.